Noh is one of the traditional performing arts of Japan. It began in the 14th century and continues to be performed to this day. Based on performing arts that prayed for bumper crop and peace, as well as being for enjoyment, Noh was loved by the common people. Active in Nara Prefecture starting in the mid-14th century, the father and son Kan’ami and Zeami grew in popularity and found their way to the then capital of Japan, Kyoto. The shogun Ashikaga Yoshimitsu, the contemporary ruler of Japan (he made Kinkaku, which is still a famous tourist site of Kyoto to this day), saw the performance of these men and was immediately enamored. Although Yoshimitsu was a samurai, he was fond of the culture of the aristocracy of Kyoto in the 8th century, known as the Heian Period. Zeami tailored Noh to the tastes of Yoshimitsu by changing it from an art for the masses to an art that fit the customs of the aristocracy. Novels such as The Tale of Genji and The Tales of Ise, as well as many poetry anthologies, were produced in the Heian Period; Zeami took these literary works and based a new style of Noh on them. Instead of producing for the stage a development of the stories of these novels, they took the form of the protagonist of these old tales appearing to a traveler and recounting the desires they still held for this life to gain repose and move on. Noh dramatized literary works from the Heian Period and earlier ages and has continued to be performed for over 600 years. In every age, the performers present their unique mindset, and that artistry has appealed to the viewers. In other words, it is an art that preserves the character of every age. Achieving blessings and repose are a major role of Noh. For human beings who live in extreme circumstances, Noh creates a visualization of the deep psychology of a variety of people. It was a staple of the cultured in the era of the 14th century when Japan was ruled by samurai, and its spirituality influenced many parts of Japanese culture. The polished performing techniques of Noh portray highly dense emotions with limited movement. Versatile music allows for a wide range of expression and creates a tension between musicians that cannot be had in western music. The masks and costumes of Noh are sustained by the industrial arts of Japan. With few props, the Noh stage leaves this up to the imagination of the viewers, depicting an abundant world through the active participation of the audience. By viewing a Noh performance, the audience is able to experience a quintessential part of Japanese culture. First-floor seats will be allocated on the day. Seating for the day can be selected on a first come, first served basis. Additional charges apply on some seats. Seats cannot be selected in advance via web or phone bookings. All second-floor seats are general admission seating. You can book tickets on this site once you have registered through the performance information page. On the day of the performance, please give your name at the reception desk. If an advanced sales price is set, the ticket can be exchanged for that sum. 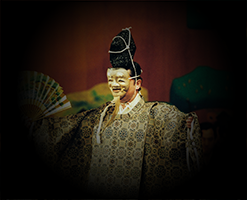 Phone bookings can be made by phoning Kyoto Kanze Noh Theater. We will ask for your name, the number of tickets required, and a contact phone number. On the day of the performance, please give your name at the reception desk. *All major credit cards are available at the ticket office located in the Kyoto Kanze Noh Theater. *If you are reserving a seat for a performance with a seat reservation option, please send the ticket payment via registered mail after making a phone booking. *All noh performances by non-professional associations (recitals by performers in training) are free of charge. Position the cursor over the image and the destination of each bus stop will be displayed. Transfer to Tozai line at Kyoto Municipal Karasuma Subway Karasuma Line "Karasuma Oike" and get off at "Higashiyama"
■From the Tozai Subway Tozai Line "Higashiyama Station"
There is a chargeable parking lot on the east side of the Kyoto Kanze Nohplay Theater, but there are times when you crowd in nearby events etc. Copyright 2019 Kyoto Kanzekaikan All right reserved.